Color - Lemon. Pullover with a very feminine poplin hem. Hoodie top. Bust - 25" across laying flat (Oversize fit). Fabric - Cotton. Loose style. 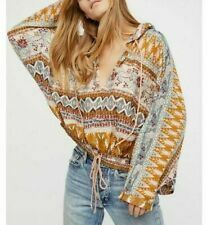 FREE PEOPLE Oversized Gray Zip Hoodie Jacket, Size M/L. Condition is Pre-owned. Shipped with USPS Priority Mail. Hoodie top. Draw string on neck and hem. We promise to resolve the issue you may have on a priority basis. Fabric - Cotton. Loose style. Length - 26"approx. Bust - It can fit to 31"-32". Good, pre-owned condition. Has a small bleach stain on one of the sleeves. Flawless, like new condition. Free People Hoodie Jacket. Shipped with USPS Priority Mail. Hoodie top. Front open cover up top. We promise to resolve the issue you may have on a priority basis. Size - Large. Bust - It can fit to 37"-38". Category: Sweatshirt. Style: Hoodie. Swimwear (23). Footwear (22). Outerwear (18). Swimwear (50). Sleep (Dorm) (15). Waist 23 23.5 24 24.5 25.5 26.5 27.5 28.5 30 31.5 33 34.5 36 37.5. Free People Hoodie Sweater. tie-string at neckline. raw seams / edges. Shoulder to shoulder - 16 1/2". cable knit. Round neck with hoodie. Oversized hoodie top. We cannot exist without You. It has label attached to it. Bust - 25"across(Laying flat). Item details. Fabric - Cotton & Viscose. Swingy,Oversized, Loose fit. (OVERSIZED, could also fit M, fitsbigger than regular size S). Perfect for spring! Free People. Very soft and comfy! Color is PEACH-PINK. Free People Black Sweater Hoodie Zipper Jacket Sz Medium. Condition is Pre-owned. Shipped with USPS Priority Mail.